DHARAMSHALA: This year 443 Tibetan students scored above 75% as against 321 in 2014, which is an increase of 38%, and if compared to 2010 of 127 students with 75%, it is an increase of 250% in five years. 16 students scored more than 90% this year compared to 10 students last year and 4 in 2010, which is a 300% increase in the last five years. The awardees for Gaden Phadrang award this year are: A) Science Stream: Michiko Yamasaki (93%) from TCV Selakui, Tenzin Kunsang (92.6%) from TCV Selakui and Tenzin Dolma (91.8%) from SOS TCV Bylakuppe. B) Commerce Stream: Tenzing Dechen (91.2%) from TCV Upper Dharamshala, Karma Tseten (90.4%) from CST Mussoorie and Tenzin Thinlay (88.2%) from TCV Upper Dharamshala. 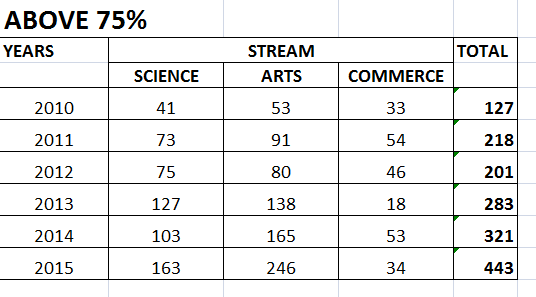 C) Arts Stream: Shawo Choeten (93.2%), Rinchen Youdon (92%) and Gongyal (91.2%), all from SOS TCV Suja. Out of the 1431 Tibetan students who appeared in the All India Secondary School Certificate Examination (AISSCE) conducted by CBSE, 1306 have passed, 25 students failed and 100 students were placed under compartment category (failed in one subject). The overall pass percentage of Tibetan schools is 91.26 which is a marked improvement from last year’s 86.7%. The Central Board of Secondary Education (CBSE) declared class XII board examination results on 25 May 2015. Among 17 Tibetan Senior Secondary schools in India, four schools namely TCV Selakui, TCV Suja, CST Dalhousie and TCV Gopalpur have achieved 100% result this year, whose average pass percentage stand as TCV Selakui (81.67%), TCV SOS Suja (74.07%), CST Dalhousie (71.43%) and TCV Gopalpur (67.64%). This year also girls of Tibetan schools have outshined boys in the Board examination. Out of 691 boys who appeared in the examination, 603 (87.26%) have passed whereas 740 girls (95%) out of 703 have cleared the examination. The Department of Education, Central Tibetan Administration, congratulate the students, teachers, staff and schools for the excellent performance in the examination.